A conjunction is a word that grammatically connects two words, phrases, or clauses together. You can combine entire sentences using conjunctions to make them more compact. In the lesson below you will learn how to use paired conjunctions: Both…and/Either…Or/Neither…Nor/Not Only…But Also in English. 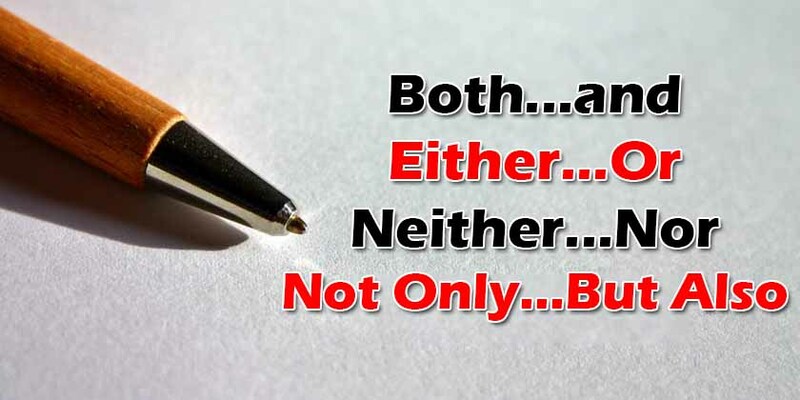 Another category of conjunctions is correlative conjunctions, and we’ve actually seen a few already, like “either…or” and “neither…nor.” In the lesson below, I am going to talk in detail about how to use these paired conjunctions: Both…and/Either…Or/Neither…Nor/Not Only…But Also. These conjunctions come in pairs and join equal items together. Both is paired with and to add emphasis to two coordinated elements in a sentence. Both Ali and Omar are good students. Both Afghanistan and Pakistan are poor countries. He is both polite and intelligent. She is both nice and kind. He works both honestly and professionally. He drives both fast and carelessly. She both studies at university and learns English at learn ESL. Bismo and Ahmed both teach classes and write books for A lingua system. She both peeled some potatoes and helped her mother with the laundry. She is both singing a song and cleaning the kitchen. Some students are both missing the class and complaining a lot. I was both surfing the internet and working on a project last night. Either Jamal or Zepher should answer my question. Either you or he can find a solution to this problem. Either Jan or Kristy will teach the conversation class today. Jamal is arguing too much about everything. 1- He is either stupid or mental. Some students can`t talk during the conversation class. 2- They are either nervous or shy. S1: Jamal had a bad accident. Oh, No! That`s too bad. – He drove his car either carelessly or fast. You should either email your resume or call the HR manager. I will either watch a movie or go to bed early tonight. Some students either come late or get absent a lot. Either you should message me or I`ll give you a call. Either they will come as usual or we should send someone to let them know. We can use neither as a conjunction with nor. It connects two or more negative alternatives. This can sound formal in speaking. Neither you nor I should argue about this issue anymore. Neither Afghanistan nor Pakistan is a rich country. Neither his father nor his uncles are nice to him. Neither my friends nor my relatives could help me when we were in the hospital. Neither Karachi nor Faisalabad is a clean city. She is neither ugly nor cruel. He is neither nice nor intelligent. Pakistan is neither rich nor a modern country. She drives the car neither carefully nor slowly. He talks to her neither nicely nor politely. He neither eats pork nor drinks alcohol. I have neither killed a human nor looked down at someone`s nose. Neither I go to Karachi nor do my friends come to Islamabad. Neither I went to Karachi nor did he come to Islamabad. Neither I have done my homework nor has my sister fixed the dinner. Neither the lazy students will improve their English nor will they graduate successfully. Not only Hashima but also Fatima came late to the class today. Not only Jan Rahimi but also Kristy is a great teacher. Not only the teacher but also the students are happy today. Not only my brothers but also my father has been to Iran several times. Not only Islamabad but also Karachi will be a modern city in the future. He is not only selfish but also stupid. She is not only kind but also patient. Pakistan is not only beautiful but also historic. He works not only professionally but also honestly. She drives the car not only slowly but also carefully. The students should do their papers not only carefully but also patiently. Our teacher teaches us not only nicely but also perfectly. He can speak English not only fluently but also correctly. Some students talk to their teachers not only nicely but also politely. I not only do go to school but also take a private course. She has not only cleaned the kitchen but also done her assignment. Islam not only does teach us how to worship and love Allah but also shows us the way of a better and perfect life in our societies. We not only did have dinner at King restaurant but also went shopping. Not only I went to my friend`s guest house, but also his other relatives came there. Not only she wanted to have a cute baby, but also her husband expected a baby son. Not only we try our best, but also our teacher encourages us to study hard. Was the article helpful? Please feel free to write your feedback about the article in the comment section below. Moreover, if you know something about the usages of conjunctions: Both…and/Either…Or/Neither…Nor/Not Only…But Also comment them below.